In February the third and fourth graders dove into three weeks of whirlwind fractions in our final Math block of the year. I made a huge push to fit in some major fraction concepts into the short time period knowing that our Math Practice periods each morning for the rest of the semester will provide ample time to further hone their skills. We began with a day of fraction review, to ease back into the swing of things. I pointed out to the students that their instinct has been to complain about math, but they might be surprised by how much they’ve already learned this year! To keep morale up during math blocks, I use gentle reminders of how capable they are to take on difficult concepts, and that I only give them what I know they can handle. As they tackle a challenging task, stick it out through the frustration, and finally gain mastery, these students are gaining the capacity to work hard. Repeated, consistent practice at working hard will benefit them for the rest of their lives. In our review, we quickly worked from the basic picture and notation work in fraction identification, to more complex word problems that are designed to help them transition to addition and subtraction of fractional numbers. 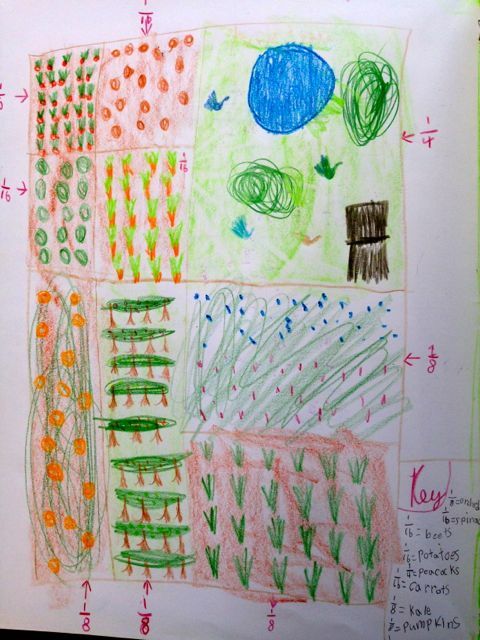 This culminated in designing their own ‘dream gardens,’ with labeling the fractions for each crop or flower on a garden map. Though their gardens quickly became more like exotic zoos, it kept them excited. All of our activities remain focused on gaining comfort in visualizing the whole, being broken into smaller and smaller parts. Next, I introduced Equivalent Fractions. 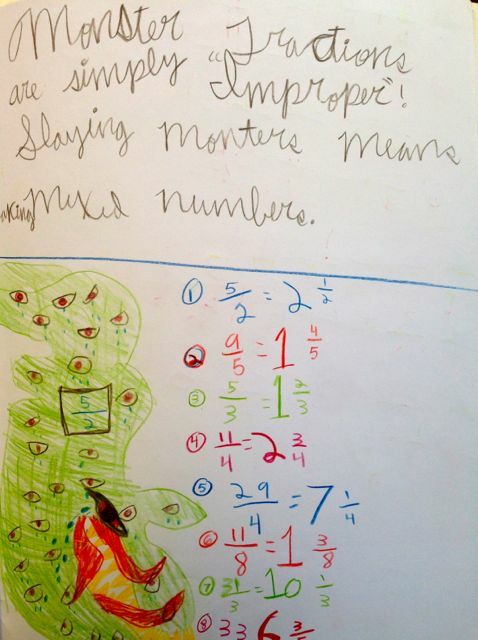 I explained that fractions like to behave similarly to the trickster, Loki, from our Norse Myths. They wear disguises to try to confuse us, but with the right tricks, we can reveal what they really are underneath! 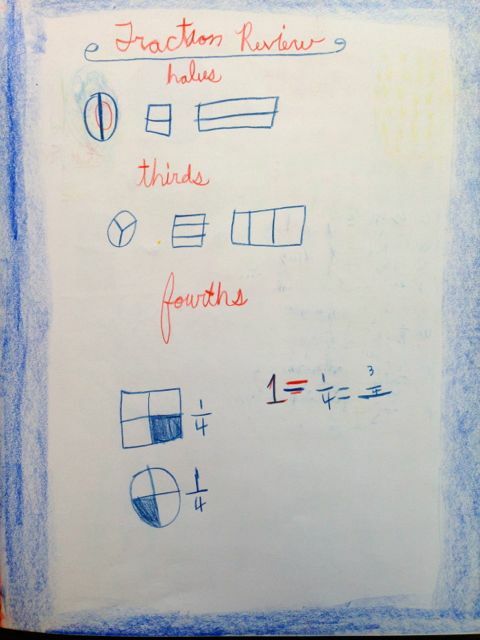 We learned how to work from a fraction in its simplest form up through its many other names. For example, 1/2 can be 2/4,3/6,4/8, etc. By learning how to write fractions in many ways, the students found it easy to work backwards and simplify fractions the next day. 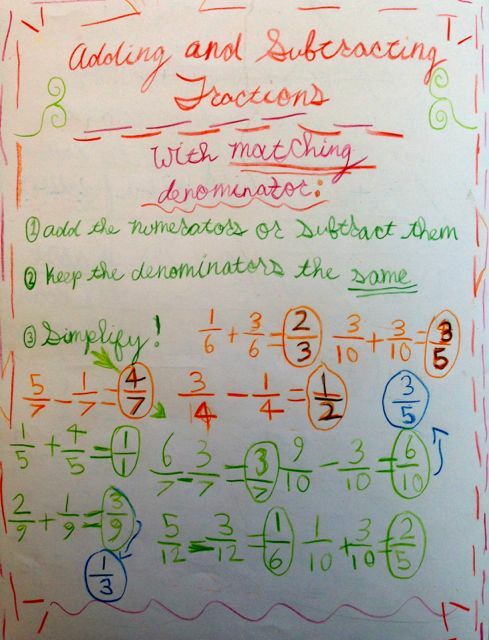 Armed with this understanding, they were ready to begin adding and subtracting fractions with matching denominators. They were thrilled by the simplicity of the adding and subtracting, noticing that “it’s really just like first and second grade math!” The only added step, is remembering to simplify their final answers down to the simplest form. At this point, all students were able to do this confidently, probably 85% of the time. We continued to practice this skill in all of our examples. We supplemented addition and subtraction with making jumps up and down a number line. 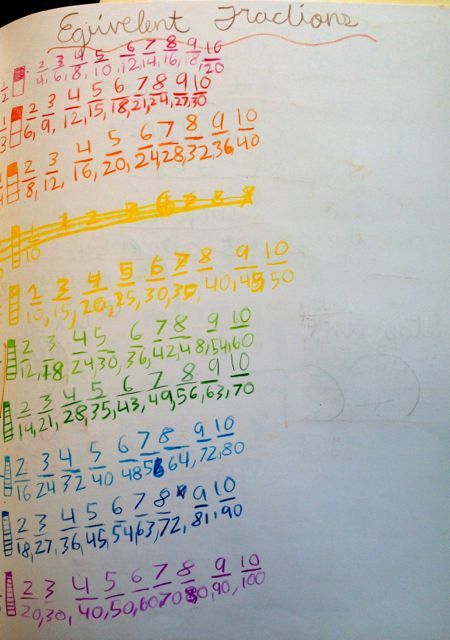 This helps me gauge their ‘big picture’ understanding and number sense when it comes to fractional numbers. It is important for the students to grasp how endless fractions are hidden in between whole numbers, and that we can count by them as easily as counting by 2’s and 4’s. On Friday, before a Valentine Party, my class spent time checking their work from previous days and getting individualized help from me on simplifying fractions. When finished, we dove into some complicated form drawings. Emma practiced a metamorphosis form, that was quite a challenge, and the 4th graders began an intricate Celtic knot. Similar to our math work, I asked them to try something that they found impossible at first. Then, with practice and guidance, their forms became consistent, balanced and lovely. I saw a class that could work hard, and quietly for a long stretch of time, while also supporting and complimenting each other. It provided a fitting and heartwarming mood for Valentine’s Day. A three-day weekend followed the Valentine party, and we started our week back up with a thrilling celebration on Tuesday in German class for Karneval or Fasching. Needless to say, it was a little hard to come back to math after all of that excitement! To their credit, however, the third and fourth graders managed to take on some challenging fraction work and fit a lot into our short week. We began by learning “Butterfly Fractions” on Tuesday morning. This was a fun method of setting up their fraction addition and subtraction problems to help lead them through a new complicated process. Now that we are beginning to add and subtract fractions with unlike denominators, they need to keep their work neat and clear to understand each step of the problem. 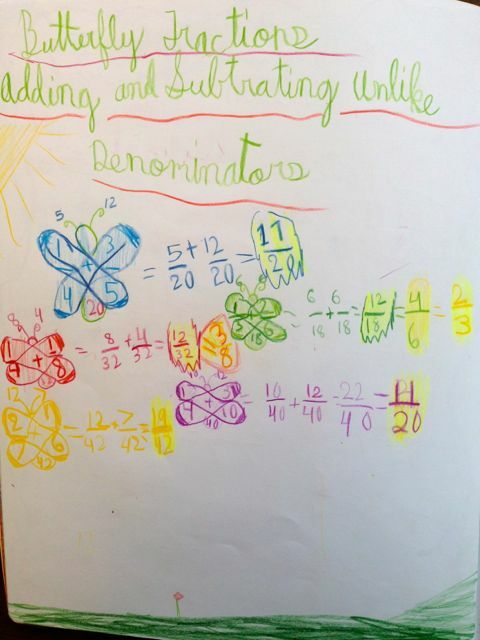 The butterfly structure led them through cross multiplication and solving for the least common denominators. It was delightful to see how the drawing element kept them engaged and led to beautiful main lesson book pages from students who normally struggle with neatness. We continued practicing this on Wednesday with time for all to complete their problems and work through questions with me. As I work with individual students, I am constantly assessing their mood and looking for signs as to what might be affecting their learning. Often, it has to do with their confidence level, and ability to stay calm when faced with uncertainty about a new skill. Especially in the fourth grade, children feel strong waves of emotions in rapid succession. I am sure all of you are seeing this at home. I strive in the classroom to keep us all in the feeling world of stories, imagination and vivacious curiosity, and out of the depths of personal, and fleeting emotion. 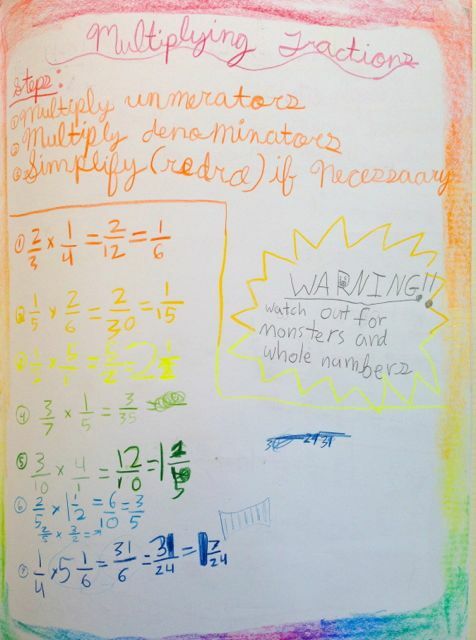 This can be a challenge as they feel their self-confidence threatened during moments of math struggles, and are tempted to quickly compare themselves to others. Luckily, they love to laugh as much as whine, and our whole day can be saved by a good joke. Keeping this delicate balance in mind, the stories throughout this block came from daily reading of “The Lion, the Witch, and the Wardrobe.” Though a few students have already read this one, I found it still served our need for release and some thrilling magic after difficult math work. I appreciated the patience of the children who had read it already, as they did a pretty good job in keeping it a surprise for the rest of us! To infuse the new content with some fun, I decided to introduce how to fix ‘Improper Fractions’ on Thursday as monsters that must be slain! Each student got to illustrate their own monsters in their Main Lesson Book, some scary, many very cute. When I introduce imaginative names for fraction concepts, they are paired with the proper vocabulary as well. I want to ensure that they know the terms without being too bogged down by them, and ultimately have a strong ‘number sense’ for what it all means in terms of fractional and whole numbers. Friday morning was a day of reviewing the week’s new concepts. They got to choose review problems from color coded columns to challenge themselves to try a bit of each category, while getting to do more in the areas they like best. This provided me with useful insight into who is most comfortable with what topics. 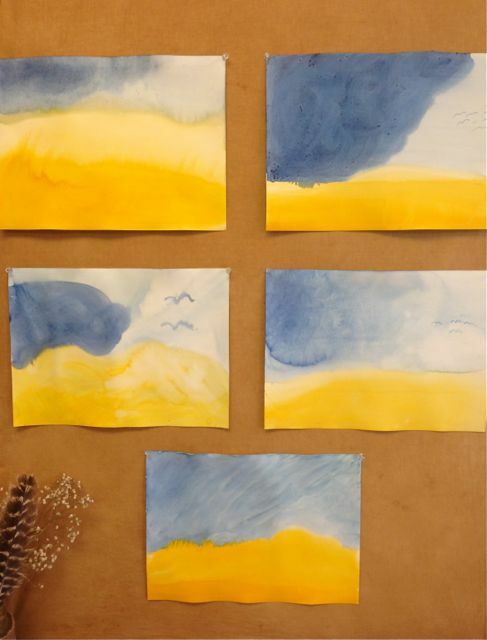 We ended the week with a beautiful painting of “The Prairie Waiting For Rain.” I told them to imagine a grey-blue sky, over a golden prairie, as the first storm of spring rolls in. We referred to our compass on our classroom walls and discussed which way we might be facing, and from which cardinal direction a storm would move in. In the third week we wrapped up our final math block. The two new fraction skills for this week were multiplying and dividing fractions. After the difficult adding and subtracting from last week, these skills proved much simpler to understand. 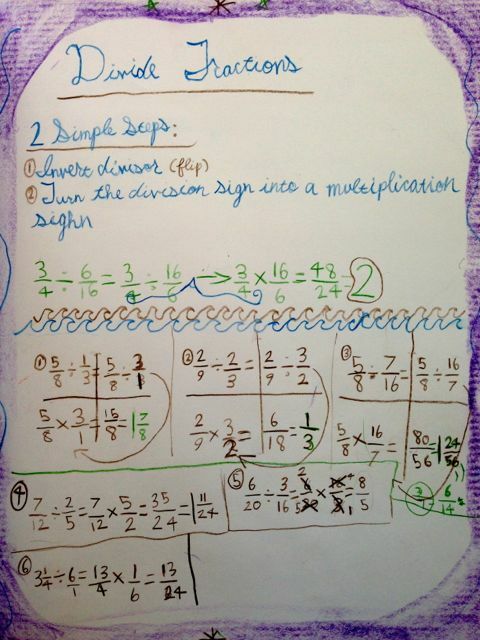 I revealed that division is simply multiplication with just one easy adjustment, and the students picked it up quickly. The children are strengthening their understanding of the many ways fractions can be written and manipulated, which will provide a strong foundation for all of their fraction work in the future. We will use the remainder of the year to continue to practice and build confidence in all kinds of fraction problems. It provides a chance to mix the newer skills with the old, and allow for plenty of review. This practice will occur both in the morning 15 minutes of math warm-up, as well as during our extra time after lunch. I will incorporate a variety of math games and activities to help us review all we’ve learned this year.